Marsh, James H.. "Hurricane Hazel". The Canadian Encyclopedia, 10 October 2017, Historica Canada. https://www.thecanadianencyclopedia.ca/en/article/hurricane-hazel. Accessed 18 April 2019. 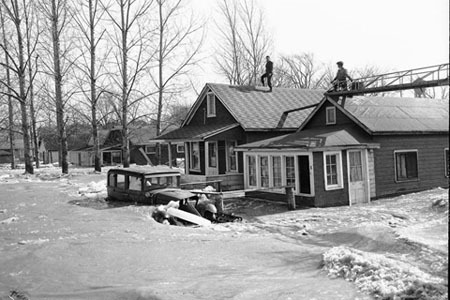 Many acts of heroism took place during Hurricane Hazel as rescuers risked their own lives taking to boats on the swollen rivers (courtesy Toronto and Region Conservation Archives). A flooded street (courtesy City of Toronto Archives/Fonds 1257 Series 1057, Item 1997). 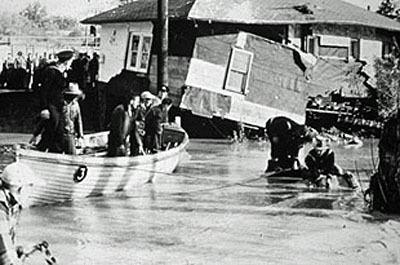 Hurricane Hazel struck the Toronto area on 15-16 October 1954, with devastating results. It was Canada's worst hurricane and Toronto's worst natural disaster. During the storm, winds reached 124 km/h and over 200 millimetres of rain fell in just 24 hours. This horrific storm left 81 dead, nearly 1900 families homeless, and caused between $25 and $100 million in damages (modern-day cost has been estimated at over $1 billion). Hurricane hunters first identified Hazel on the afternoon of 5 October 1954, about 75 kilometres east of the island of Grenada in the West Indies. At this point it already had winds of 160 km/h. The storm tracked along the coast of Venezuela before suddenly swerving northward towards Haiti, where it left between 400 and 1000 people dead and destroyed 40% of the island's coffee trees and 50% of the cacao crop, adversely affecting the economy for several years to come. By 14 October, Hazel was battering the Carolina coast, with estimated wind speeds of 240 km/h, and a tidal surge of 4 metres. It destroyed the entire town of Garden City, South Carolina, leaving only two of 275 homes standing. It tore through the western suburbs of Washington, DC, and across Pennsylvania and New York, causing $1.5 billion in damages and killing 100 people in the United States. As Hazel approached Ontario, the Dominion Weather Office tracked its erratic path as well as the predictions by the American weather service, and issued warnings to broadcasters. However, few people had experience with hurricanes and were unaware of how to prepare, leaving them vulnerable to the storm's power. After moving inland from the Carolina coast, Hazel seemed to abate over the Alleghenies, where American meteorologists predicted its dissipation. Here, however, the storm was re-energized by a low-pressure system and broke loose towards Lake Ontario and Toronto. By 4:30 P.M. on 15 October, rain began to fall heavily on Toronto. Underpasses began to collect water, but by 7:00 P.M. the traffic had mostly cleared. Yet as Chief Meteorologist Fred Turnbull warned, "The worst is yet to come. This is the pause that always comes during a hurricane." (Betty Kennedy, Hurricane Hazel, 1979) The pause was not the anticipated "eye" of the hurricane; it was the pause before the deluge of rain inundated the city's rivers. While the storm struck the Toronto area with heavy winds, the greatest destruction resulted from flooding. Much of the Humber River drainage basin was deforested, which allowed water to quickly flow into the river. The flood plains, already saturated by days of rain, simply could not contain the downpour. As the flooding escalated, 40 highways and main roads were submerged. Passenger trains were knocked off their tracks. Forty bridges were destroyed or structurally damaged and ten were out of commission because of damage to the approaches. In Woodbridge, the Humber swelled to 107 metres at its narrowest point; nine people died and several hundred more were left homeless. Two men, Murray and Clyde Deadder, were killed when their car was caught in floodwaters in Thistletown, where 12 families were left homeless. Many brave rescue efforts were undertaken, even though the current was strong enough to endanger most boats. 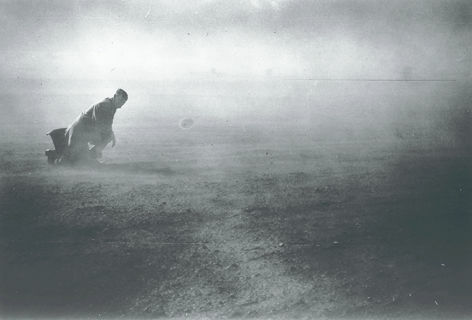 Several would-be rescuers launched missions to save stranded people, only to need rescuing themselves. Five firefighters from the Kingsway-Lambton Fire Station were killed when they attempted to rescue people stranded in a car by flood waters from the Humber River. Their fire truck became stuck on a flooded street and overturned, and the men--weighed down by heavy jackets, boots, and equipment--were tossed into the water. Lessons were learned from the tragic loss of life and environmental devastation of Hurricane Hazel. Conservation authorities, local municipalities, and the province together developed a comprehensive plan for flood control and water conservation to significantly reduce the risk to life and property posed by extreme weather events. After Hazel, the provincial government amended the Conservation Authorities Act to allow conservation authorities to acquire and regulate vulnerable lands (including the former Raymore Drive) for recreation and conservation. In 1959, the Metropolitan Toronto and Region Conservation Authority initiated plans for the development of large dams, reservoirs, and major flood-control channels, and for an erosion-control program. In addition, large areas of land were identified for acquisition and conservation. Regulations enacted since Hurricane Hazel restrict new development in flood plains, allowing rivers to flow naturally and reducing the risk to people and their property during flooding.